This entry was posted on Thursday, September 20th, 2012 at 9:03 pm and is filed under Children, Civics and Citizenship, Department of Education, Department of Homeland Security, U.S. Citizenship and Immigration Services. You can follow any responses to this entry through the RSS 2.0 feed. You can leave a response, or trackback from your own site. 25 Responses to Quiz: Are you smarter than an 8th grade Civics student? I am embarrassed! I was wrong on 2 out of 3 questions…..school was a very long time ago. It may be time for those flashcards, especially since I am helping someone study for her citizenship test! 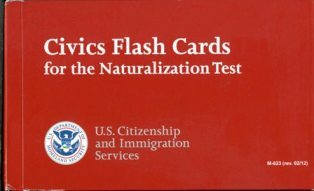 Thank you….Nice that the Flash Cards are available for studying, but (if you know), doesn’t the Citizenship test have to be taken in English? Jan- I did some quick research, and it turns out there are a few “Exceptions & Accommodations” to taking the citizenship test only in English. This article on the U.S. Citizenship and Immigration Services site explains them. Thank you! You have been extremely helpful! To answer to this question is quite simple, just look off the poll result. I didn’t do well as I would have liked on this quiz. Maybe it’s time to take another look at my government books from college. Thanks so much for your interest! Since we are a Federal site, you can feel free to quote us (and credit us) to your heart’s content… We love to know our content is helping fulfill our mission of “Keeping America Informed.” Drop us a line when you do! Would love to know the percentage of eighth graders got all of these correct. Jan- To see some sample Civics questions from the 2010 8th grade NAEP (National Assessment of Educational Progress) exam. Also, here’s the full Civics Framework of the civics skills and knowledge that 4th, 8th and 12th graders should exhibit. This part outlines the various standards of civics proficiency an 8th grader should have. I enjoyed this little grammar school exercise. Nevertheless, as a sixty-year Westerner who has never traveled east, to my chagrin, I’ve forgotten by national geography! How embarrassing. Thank you. Makes me feel out of touch and I could sure use a refresher course! This is why a lot of school teachers, parents and citizens get them for themselves just to catch up. Covers issues like the electoral college and who can run for office. I enjoyed my set of the Flash Cards for the same reason! Reblogged this on Jestoryas's Blog.